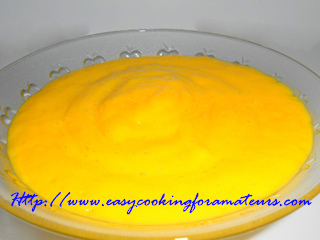 Aamras is popular dessert in Maharashtra & Gujarat, also known as mango shikarni. Usually it is served with puri or chapati (Indian breads) or as a simple dessert or with ice cream. 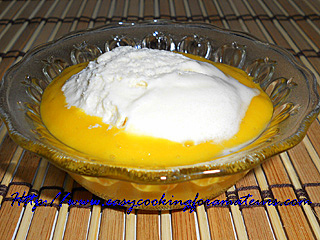 Note: Aamras should be sweet, if mango is sour (tangy) it requires more sugar. Usually jaggery is used instead of sugar. Jaggery gives more taste. You can also add 1/4 tsp cardamom powder & little ginger to it for more flavor. In a blender blend all the ingredients to smooth paste. Aamras is ready to serve. It can also be refrigerated & served as dessert or with ice cream. So luscious n creamy ~ absolutely love it! lovely colour n yummy too..
wow..very delicious and yummy dip..great with rotis too..lovely recipe..
Feel like finishing that delicious dip, love to have with some puris..yumm! Lovely looking dip. Looks very tempting. Creamy and tasty ... lovely pictures. I love this recipe a lot.. looks perfect !! Mango dip looks delicious and perfect. i am in love with anything that has mangoes. Gosh! especially now when I am trying to lose some weight & should not have mangoes I want them more. Love this.